This week's color inspiration is PINK. One of my very favorites. 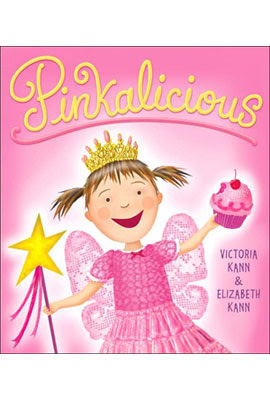 My little niece Sophia loves pink... her favorite book is pinkalicious. It is about a little girl who turns pink after eating too many pink cupcakes. I knit her the little bunny hat for Easter. I think she wore it for about 30 seconds. Sigh. I never miss the chance to knit that baby something pink. I just got this brown and pink purse from Vera Bradley. I love it. My mother in law gave me that beautiful hobnail pitcher. It was stuck in the top cupboard at her house being unappreciated. A sweater to be perhaps? See the world through rosy glasses today and think pink! Pink is so great ;)) That pitcher Donna gave you is AWESOME! Glad she thought to give it to you and not Goodwill, where you would probably have come across it anyway! I really adore that china with the big white polka dots, too....a favorite! Pink might be Colleen's favorite, but YOU are MY favorite. I looooove you girls so much! Pinkalicious indeed! That baby and hat are so sweet they make me wish I knew someone who had a baby that I could slobber all over - then give back. But I want that little phone. Oh my..I love that photo of your lovely niece Sophia, and I love her name..I did sign to follow you before but the follow on the top tool bar is not the best way to do so. So I followed by using the side bar option. Thank-you so much for visiting ladies! It's so nice to meet you this fine Saturday morning...I'm visiting some links on the Pink Saturday Post with Beverly...and your photo was interesting! I love the things you knit...and I'm your newest follower. Please do stop by and visit with me too.....if you like! Your neice is adorable! What pretty things that you knit. Thanks for sharing!